Do you have a Pilates Question for me? Are you having difficulties deciding which Pilates exercises are best for you to do or just how to do Pilates exercises safely? Do you have a bad back, sore hips, shoulders, or a weak core? This is where you can ask me anything you want regarding your specific health condition and I will try to direct you to the best Pilates-based exercises for you! You can also find all my Pilates healthy back and joint exercises in my ebook here. It's free and it's easy to do. Due to the volume of questions I receive I decided to start this page to answer any questions you may have starting Pilates and/or deciding which exercises might be most beneficial for you. Maybe you just wonder what Pilates really is and what it can do for you? Then check out this page to find out what is Pilates. This will also give you a chance to read about back and joint problems that others are having that may be similar to your own. Maybe you don't have a question, but you want to share with others a success story you've had with Pilates. We would all love to hear how your back pain has gone away since you started doing Pilates, or maybe you have rehabilitated a frozen shoulder or knee or hip replacement using Pilates Exercises. Do you have Osteoporosis and found that you were shrinking? Then, after doing Pilates, you have gained back an inch or so due to the postural changes in your body. I measure my own clients with Osteoporosis and other spine and postural conditions and have found many of them have grown! If you don't have a Pilates question for me right now but would like more information about how Pilates exercises can benefit you check out all my free articles and information here. Are you searching for general Pilates articles or a particular piece of info? You may use this Google search box to help find specific phrases or topics. 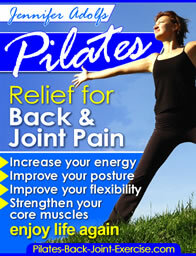 Be sure to check "Pilates-Back-Joint-Exercise.com" so you know you are getting the absolute best advice. Ask a question or tell your Pilates story. The advice I give is only my opinion and I encourage you and others to help me by contributing to the answers. It is a two-way web page. You can ask a question, answer a question, or tell a story about how Pilates has helped you. You can become my co-expert on these questions by rating and submitting comments. You can still contact me if you have a personal question that you feel would not benefit others or needs a more personal response. Important: When you ask a question, please include as many details about your condition as you can. Give your Pilates Question or Story a Title. Shoulder Ebook Exercises for pain and following a shoulder surgery. 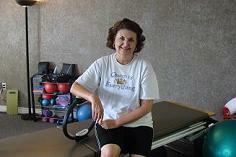 Pilates Exercises after Total Hip Replacement. Can Pilates Help Sciatic Pain?